Chasing Dreams will be on hiatus for the next couple of weeks as I take my next major journey – this time to Africa, specifically Kenya and Tanzania. With t-minus <one week I am almost overwhelmed with anticipatory excitement thinking of all that awaits – the magnificent plains, deserts, savannas lakes, rivers and mountains – even craters (Ngorongoro – see lower left of map). The expanse of sky – humbling sunrises, sunsets – I should finally be able to see and maybe photograph the Milky Way. And then there are the animals. According to recent reports, the annual Great Migration is under way and there are multitudes of wildebeests, antelope, zebra, lions, etc. etc. pouring into the parks I will be visiting. I probably will not sleep until the plane ride home. As you know I do a great deal of planning and research before each trip and this upcoming voyage had the most intensive pre-trip requirements of any trip thus far. 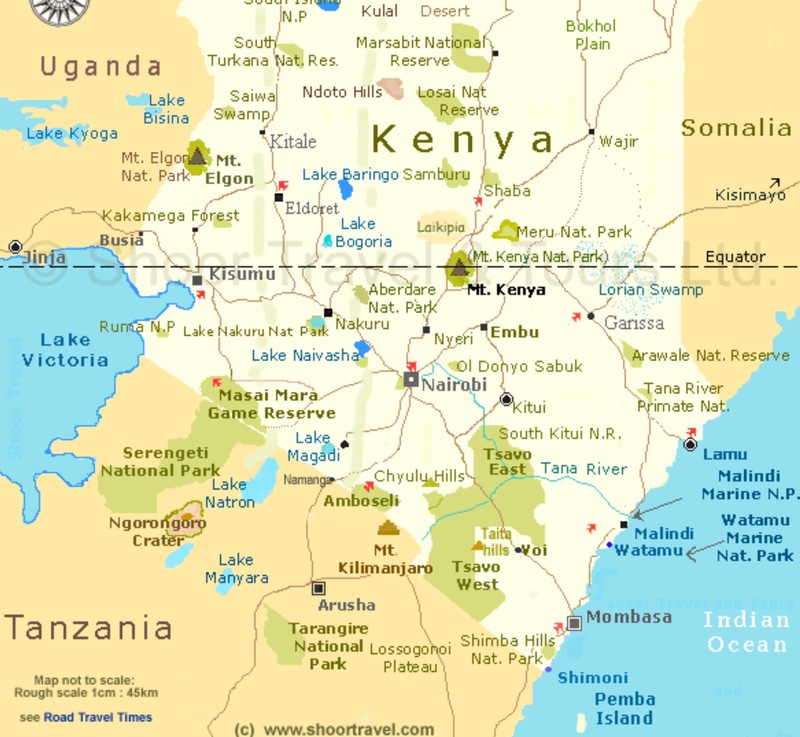 First there are the visas necessary for entry into Kenya and Tanzania. Before visiting Russia and China I also had to secure visas but in those cases I went to their embassies in New York City and within two days had my papers. In-person applications are no longer permitted for these African countries. Instead Kenya provides an online service while Tanzania requires snail mail applications. Done and done with minor complications. Then there are the shots. My distaste and anxiety for taking injections are surpassed by my fear of contracting a serious disease – so I offered up my arms for Hepatitis A, Typhoid, Yellow Fever and Tetanus – and whew – there were no reactions. Next up I will begin a regimen of taking daily malaria pills for two weeks commencing the day before I leave. There is a chance of experiencing vivid dreams under this medication but since I already have quite interesting dreams this should not be an issue. Despite my penchant for doing things way in advance I do not pack until right before taking off. This time before I pack I need to spray all my clothes including my socks with Permethrin to thwart all the flying insects and creepy crawlies. The items I will pack are a particular challenge – after all I am a New Yorker so the majority of my outfits are black. If not, my other go to’s are bright colors, animal prints and sparkly things. All of these are verboten. I have actually had to buy some inexpensive BEIGE! Tops which may remain in Africa. Then, all of my clothes, toiletries, sunscreen, insect repellent, camera and electronic equipment have to go into one large duffel bag – we shall see. It will all get done and this is going to be AWESOME. I will try to post a few pics on Instagram @cgurmann so you can see what I am doing. Will return with hopefully mounds of material for future Chasing Dreams posts! This entry was tagged AFRICA, KENYA, MIGRATION, PHOTOGRAPHY, SAFARI, tanzania, TRAVEL. Bookmark the permalink. We went to Kruger this past June & now working on an itinerary for Kenya & Tanzania. Any info you can provide on lodges, etc would greatly be appreciated. Our trip was with Abercrombie and Kent so the places we stayed were their selection – but they were all wonderful. Kenya: Tawi Lodge (Amboseli) Sanctuary Olonana (Masai Mara – I believe A&K owns this compound). Tanzania – Sanctuary Swala (Tarangire) Gibb’s Farm (Ngorongoro) Four Seasons Serengeti. Good luck! Thank you for the info. We’re you happy with the Company you used & the places you stated. We did Kuger on our own & Cape Town – all the escorted tours made stops at locations we wern’t interested in. South Africa was easy to plan, but Kenya, etc is so spread out that we might consider doing an escorted bus tour. I read in the Mara you should stay in the private conservancies to avoid mini-buses & tons of jeeps. Did you find this to be true. And did you see any of the migration? In advance, thank you. Yes we saw thousands of wildebeests and zebras crossing the Mara. A&K provides open air jeep safaris – there were no buses in any of the parks we visited AK guides knew where to take us to get best views with minimum of other jeeps around – as you can see from my posts it was phenomenal! What dates were you there & how was the weather? BTW loved your photos!